Writing every day helps me feel better. Writing soothes depression. Not long ago I wrote those words in my journal, after a month of writing consistently. No doubt you’ve had times in your life like I have, when you’ve felt sad, downhearted and unhappy. Writing, I’ve discovered, makes a difference. Perhaps you’ve also experienced, or are currently experiencing clinical depression, with more serious, long lasting symptoms. I’ve been there too, at an earlier time in my life. And what I want to tell you today is that no matter where you are on that continuum, from minor to severe, writing soothes depression. That is, if you give it a chance. The most important part of what I just wrote is the part about giving writing a chance. Because, of course, writing soothes depression only if you start writing! It makes sense, right? We all know this. But the hardest thing about depression is that its darkness can weave its way through almost any possibility in front of you. Depression can strike alarm bells and warn you that nothing’s going to stem the stuckness and emptiness you feel. Depression may tell you that you can’t possibly muster the energy to try something new (or return to something you’ve done before), like writing. So it’s good to know going in that while writing soothes depression, it’s not magic. It actually is a little bit magical, but I can’t exactly explain why. Trust me. While I can’t tell you that writing will quickly snap you out of depression, I do believe it will make a difference. Start with the smallest amount of writing. Truly, the barest minimum. Can you manage to write for five minutes? If not, how about one minute? Or can you write one word? Then start with that tiny increment. And if that feels like too much, can you get out your journal and hold the pen in your hand for a few minutes? If so, consider that a success for the day. Let yourself start in the smallest way, and believe that the momentum will carry you forward, as you do a little bit more each day. Write the old-fashioned way, with pen and paper. The benefits of writing by hand are well documented. Your brain loves it, it enhances focus, creativity and problem solving, and you’ll feel calmer and more resilient if you do it consistently. Plus, it keeps you away from the distractions of screens, which are known to exacerbate depression. Writing soothes depression when you write down into your senses. This can be as simple as describing in the moment what you’re seeing, smelling, tasting, hearing and touching. Depression can leave you feeling numb and writing into your senses helps awaken them and relieve the numbness. Write outside near nature, open space and greenery if you can. Perhaps you can write on your patio or in your garden. Maybe in the park, at a picnic table or bench. At an outdoor cafe. Even sitting in front of a window and looking out at a tree makes a huge difference. The combination of nature and writing is such a tremendous mood enhancer that I’d love to see all of us doing it! Use simple writing prompts that are open-ended rather than question-based. Consider a line from a poem, or open a book or magazine and quickly grab a few words to help you get started. Let the words choose you, rather than thinking you have to find the perfect writing prompt. Then let your pen carry you, and trust it to take you into the writing flow. This limits your need to make decisions, which is important, because when you’re feeling down you’re probably already experiencing decision fatigue. It also removes the need to answer specific questions with your writing, which can be exhausting when you’re depressed. Add color, images, doodles and other embellishments to your journal page. This simple technique enhances the power of writing to soothe depression. You can also place your journal in landscape mode and write sideways. Or consider writing on an angle or in a circle. You don’t need to do this every time you write, but your brain does love novelty and this will help it sit up and pay attention. Write about positive experiences and pleasant memories you’ve had in the past. Write “as if” you’re in the experience or memory right now. Imagine stepping into the scene before you start, and feel the experience in your body as you write. Write down compassionate words. Consider words you would say to a friend or dear one if they were feeling sad or depressed. You also may want to fill your journal with uplifting quotes, or snatches of poems and prose that touch you personally. Write in detail about past experiences when you’ve felt cared for and cared about. Go ahead and capture them even if they seem small and inconsequential. Like the day the barista took extra special care with your drink. Or a friend gave you the best hug. Or your partner made that soup you love just because. When we’re able to remember and write down these caring experiences, our inner nurturer gets a natural boost. Finally, stop writing if it feels very dark or difficult. Often, writing soothes depression by helping release bottled up emotions. However, if it becomes an exercise in ruminating and rehashing with no end in site, it’s better to move on to something else. Move towards a different theme, perhaps simply describing what you see right in front of you for five minutes. 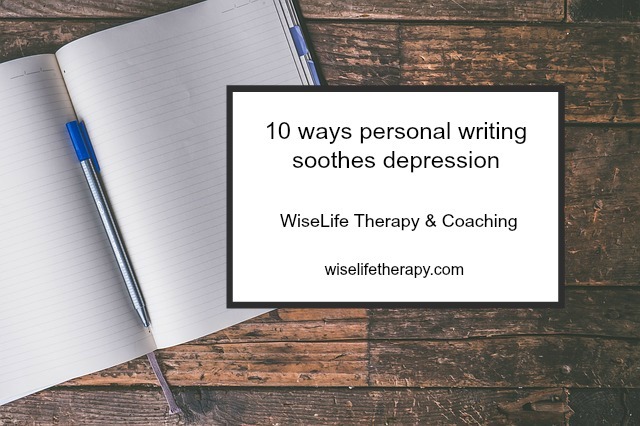 Bonus: writing soothes depression when you write with others. Practice any of these writing activities in a supportive group or with a supportive person by your side and you’ll probably multiply the benefits. So remember: there is a deep, wise part of you that knows you can feel better. That knows you can move beyond depression’s negative world view. And as one writer to another, I’m rooting for you! When I look back on my personal story through my journals, it struck me my words had an unmatched power to heal me. To change me.